It’s the end of summer here in New York City, and SeatGeek.com has access to the hottest tickets in, and around the city, including this year’s 2010 US Open Tennis Championship, taking place at the National Tennis Center in Flushing, Queens, New York from August 30, 2010 – September 12, 2010. The draw for the first round of the tournament for both men and women is this afternoon, however we wanted to take a look at the pricing for tickets in Arthur Ashe Stadium, the main stadium at the National Tennis Center. The games biggest stars usually grace Arthur Ashe Stadium, and we want to give you the information you need to make intelligent buying decisions before you ride the 7 train out to Flushing. 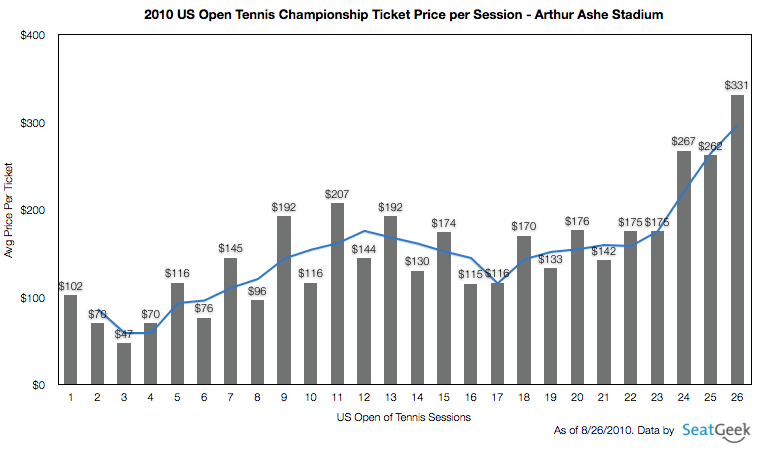 Below is a graph showing the average ticket price per each session at the 2010 US Open for Arthur Ashe Stadium. Ticket prices for the earlier sessions in Arthur Ashe Stadium are significantly lower than those for sessions later in the tournament, as to be expected. The lowest average price is for session 3 with an avg price per ticket of $47, which takes place on August 31, 2010, at 11:00 AM. Tickets to that session can be found here. The highest average price of the tournament is for session 26, the men’s final , with an average ticket price of $331. Tickets went on sale earlier this summer, however the men’s and women’s draw won’t be unveiled until this afternoon. Below are a list of the US Open rankings for both men and women. If you have any questions or comments about the post, feel free to leave a comment or email me at alex@SeatGeek.com. Don’t forget to follow us on Twitter @Seatgeek, and Like us on Facebook.